Since 2017, the Michigan Highway Maintenance Conference (HMC) has been providing maintenance training for operators, mechanics, and other front-line workers, as well as foremen, supervisors, and superintendents. Sessions cover training-related topics ranging from safety, regulations, and requirements, to repairs and methods. An optional pre-conference workshop provides attendees with a hands-on experience of maintenance- and safety-related tools and techniques. 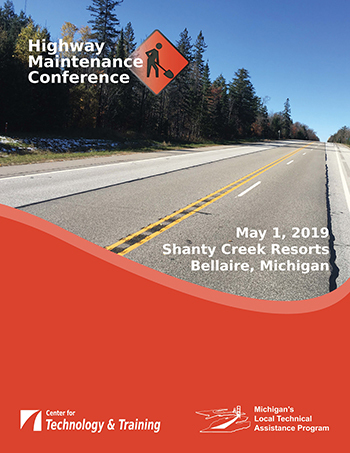 You can learn more about the Michigan Highway Maintenance Conference by exploring the 2018 conference flyer as well as presentations from previous conferences, accessible from the "Previous Years" tab. The Michigan HMC is a conference of the Center for Technology & Training (CTT). It is hosted each year by the CTT, home of Michigan's Local Technical Assistance Program. For more information on the program and for registration information, please explore the tabs, above on ctt.mtu.edu/highway-maintenance-conference. The conference addresses maintenance training and information about safety, construction, repair, and regulations. Preceding the conference is a pre-conference workshop (see details for this separate event, below). You must register separately for the Highway Maintenance Conference and the HMC Pre-conference Workshop. Seating is limited; register early to ensure participation. Registration does not include accommodations; the conference flyer will contain details on accommodations that are available for participants. Please notify us in advance if you have special dietary needs. NOTE: Michigan Tech reserves the right to use any pictures taken during this event for advertising and/or instructional purposes. The Highway Maintenance Conference counts for instructional hours of continuing education for professional engineers. The 2019 HMC Pre-conference Workshop​ also counts for instructional hours of continuing education for professional engineers. The number of instructional hours will be noted in the event's flyer. The CTT’s continuing education policy is available at ctt.mtu.edu/continuingeducation. Preceding the Highway Maintenance Conference is aHMC Pre-conference Workshop. This workshop will be held on Tuesday, April 30th in Bellaire, Michigan. The HMC Pre-conference Workshop covers implementation of the Manual on Uniform Traffic Control Devices (MUTCD) for short-duration, mobile, and flagged operations, including daily lane closures. It emphasizes the use of standard operating procedures for implementation and focuses on common strategies to improve operational safety, effectiveness, and efficiency. Registration does not include accommodations; the conference flyer will contain details on accommodations that are available for workshop participants. Please notify us in advance if you have special dietary needs. NOTE: Michigan Tech reserves the right to use any pictures taken during this event for advertising and/or instructional purposes.